Electric heated blankets can help you keep warm and cozy on those especially cold winter nights, without raising your heating bill. Electric blankets come in several forms: blankets, throws and even mattress pads. The best models are safe, comfortable and easy to use, and provide sufficient, even heat. Here I’ve sorted through user reviews and expert opinions to create a buyer’s guide to the best electric blankets, mattress pads and throws on the market today. Getting a good night’s sleep on a cold winter’s night can be a challenge, but heated bedding can be a big help. Electric blankets, electric throws and heated mattress pads offer a lot of appeal for people who would love to crawl between preheated sheets on a chilly night. Those suffering from cold feet in the middle of the night might find them a godsend. Additionally, some claim that an extra warm bed helps alleviate body aches. Electric blankets, electric throw blankets and electric mattress pads make a warm bed a reality with just a flick of a switch. Many have preheating functions, which allow you to set a desired temperature while getting ready for bed. Heat controls typically feature up to 10 temperature settings so you can get the level of comfort that’s right for you. Additionally, many queen-sized and larger models may have two controls, one for each side of the blanket. That means one sleeper can stay as cozy and warm as they prefer without giving the other a case of the night sweats or a cold shoulder. Electric blankets haven’t always enjoyed the best reputation. Older models tended to be thick and scratchy, and sometimes posed a fire hazard with extended use. Modern heated blankets are much improved. They warm you with thin, supple wires sandwiched between layers of ultra-soft fleece, plush, or knitted material. Learning from the past, safety ratings are now paramount, and electric blankets and mattress pads come with automatic shut-off timers and amply rated power adapters to keep the bedding — and you — from overheating. Others, like the Soft Heat Luxury Micro-fleece Blanket pictured below use low-voltage electricity, which experts consider safest of all — and are an especially good choice for those with pets. Additionally, most modern electric bedding can be machine-washed and even machine-dried, as long as the manufacturer’s recommendations are observed. Electric blankets offer convenience and versatility. They can easily be put on or pulled off a bed, even in the middle of the night if you get too warm and the blanket has yet to cool down. However, since they lay above you on the bed, they lose a little bit of efficiency as heat that’s radiated upwards is lost. Heated throw blankets are similar, but smaller. They won’t generate as much heat as a full-sized electric blanket, but are great for wrapping around yourself, say while curled up on your couch on a chilly night. Electric mattress pads sit between you and your mattress. That makes spur-of-the-moment use more difficult (unless you want to strip down the bed to pull it on or off), but improves energy efficiency — you, not the ceiling, are the beneficiary of heat that’s radiated upwards. The Electric Blanket Institute also holds that heated mattress pads are “inherently safer.” Electric blankets can get bunched up, allowing heat to buildup — and that was a major source of electric blanket fires with older models that lack modern safeguards. Since a heated pad is held tight to the mattress, there’s much less chance of that happening. While there are a multitude of electric bedding brands offered in the U.S., the Electric Blanket Institute reveals that the vast majority of products are currently made by one of three manufacturers — Biddeford Mills, Sunbeam or Perfect Fit Industries. The Institute adds that, while materials and controllers will vary, all heated bedding made by that manufacturer, regardless of branding, will perform similarly. Electric blankets, heated throws, and heated mattress pads receive little attention from professional reviewers, Good Housekeeping being a notable exception. Its testing is several years old, but most of the electric blankets and heated mattress pads rated there are either still sold, or are offered in nearly identical models. The Electric Blanket Institute does not rate electric blankets or mattress pads, but offers helpful buying guidance and discusses the differences between models offered by the major manufacturers. Owners fill in the rest of the picture. While not every electric blanket, electric throw or electric heating pad gets tons of feedback, others draw hundreds and sometimes thousands of reviews across sites such as Amazon.com, Walmart.com, ComfortHouse.com and elsewhere. When analyzing reviews to find the best choices, I look for feedback regarding performance, ease of use, comfort and the overall ownership experience. 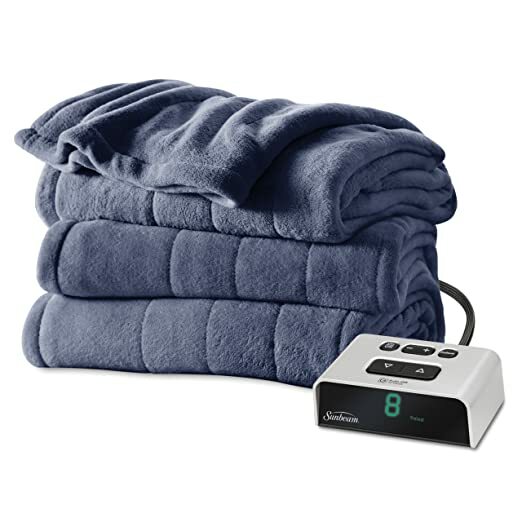 Not every electric blanket, electric heated throw blanket, or heated mattress pad excels on every point, but the very best ones will outperform the competitors in most regards. One of the most-reviewed heated blankets on Amazon.com, this cozy microfleece has garnered a lot of feedback there. At ComfortHouse.com, site owner Jeffrey Gornstein notes that the Soft Heat blanket receives the highest ratings and the most reviews of any blanket it carries. 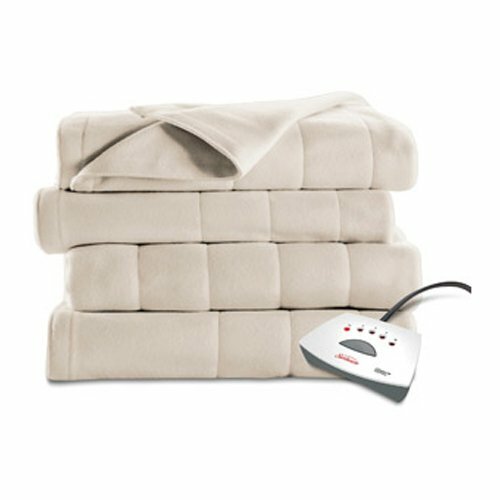 Made by Perfect Fit Industries, the Soft Heat electric blanket converts the AC used by most electric blankets to safer low-voltage DC. Perfect Fit is the only maker of low-voltage electric blankets in the U.S., and its products are the only electric blankets sold here that meet Underwriters Laboratories standards for “non-hazardous low voltage,” the Electric Blanket Institute reports. However, all the heated bedding in this report meets the latest Underwriters Laboratories standards for electric bedding safety and should be perfectly safe to use as long as manufacturer instructions are followed. The Soft Heat Luxury Micro-fleece does take a bit more time to warm up than other electric blankets, but users say the added safety and “soft warmth” from the blanket are worth it. Additionally, it chews through less electricity over the course of a night’s use than most other models. Speaking of chewing, if a cat or dog often shares your bed, the low-voltage of the Soft Heat electric blanket will minimize the shock hazard in the event of claw or chewing damage — though your pet could still damage the blanket itself. That’s why experts recommend heated mattress pads as the best choice for pet owners. Despite the light weight of the Soft Heat blanket, its polyester fabric manages to keep in the heat all night — or at least until the 10-hour auto shut-off kicks in. 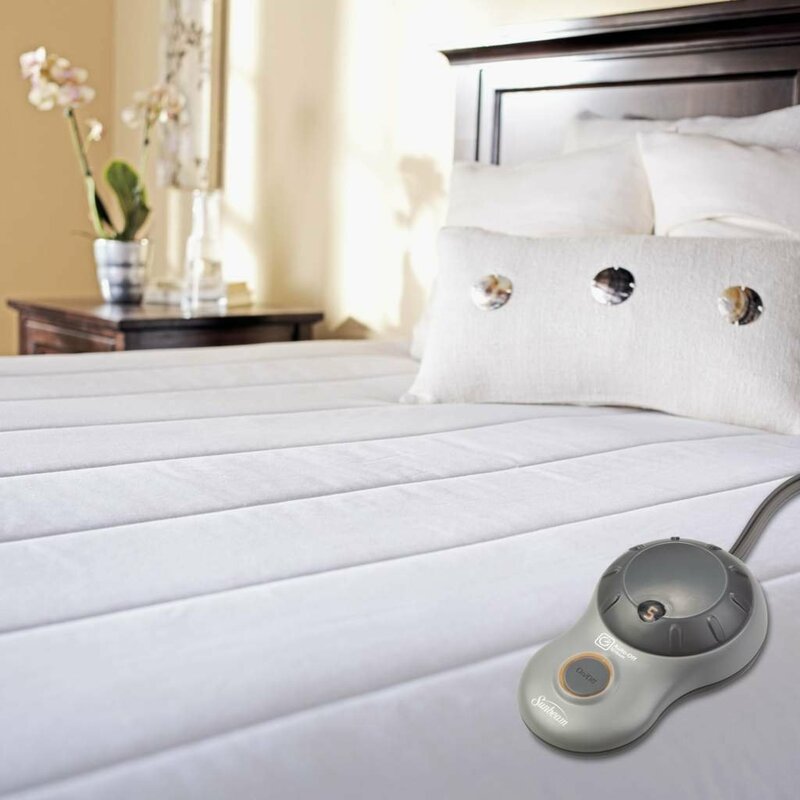 Note that auto shut-off is a standard safety feature that is included in all of our recommended electric blankets. The Sunbeam Microplush Heated Blanket (Est. $65 and up) is another strong choice for those looking for the perfect blanket to warm their beds this winter. This is a standard, AC-powered, non-low-voltage electric blanket, though with modern safety features and, as noted above, it meets the latest Underwriters Laboratories electric bedding standards. Heating technology aside, this Sunbeam electric blanket has very similar specifications to the Soft Heat Luxury Micro-fleece: It comes in the same sizes, has the same number of heat settings (10), the same 10 hour shut-off time and the same warranty duration (five years). However, the Sunbeam Microplush heats faster and, according to some users, feels hotter to the touch while heating than the Soft Heat Micro-fleece. Some versions of the blanket sold at different retailers may have controllers with different features — for example, while most electric blankets have an auto-off feature that will turn off the blanket after 10 hours, the version sold at ComfortHouse.com lets the user change when the blanket will turn off — but core performance will be the same. Both the Soft Heat and Sunbeam blankets win praise from users for their soft fabric. 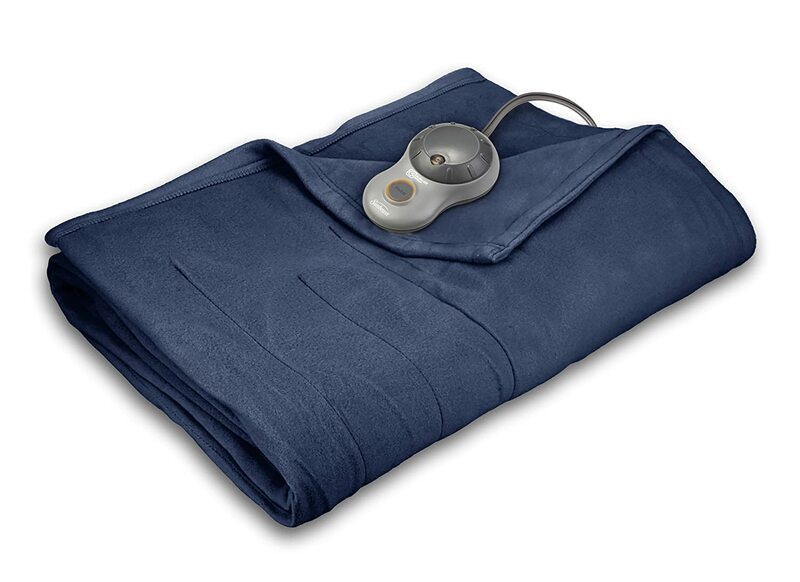 For those on a tighter budget, Sunbeam Electric Heated Fleece Blanket (Est. $50 and up) looks like a good alternative. You can find it a Amazon.com, where it earns a 4.2-star score based on more than 850 reviews. This Sunbeam electric blanket looks to be fairly feature-rich for a budget model. It has a preheating function, a six foot cord, and dual controllers for queen and larger sizes. The one corner that does look to be cut compared to other Sunbeam electric blankets is that there are only five heating levels, but that doesn’t surface as a concern in user reviews. Durability also looks good — though like nearly all electric blankets we looked at, complaints about blankets that arrived dead or missing a control, or that failed prematurely are not unheard of. More common are complaints that the quilted fleece blanket was thinner than the owner would have liked or that the material was not soft enough. For sleepers who prefer the secure feeling of a thick blanket, the Sunbeam Quilted Fleece Heated Blanket (Est. $63 and up) could be an option. I’ve seen comments that even with the electricity off — or out altogether — it’s warm enough to keep you cozy anyway. As with virtually every electric blanket, reliability is a concern, but its 3.9 star rating is good for this category.